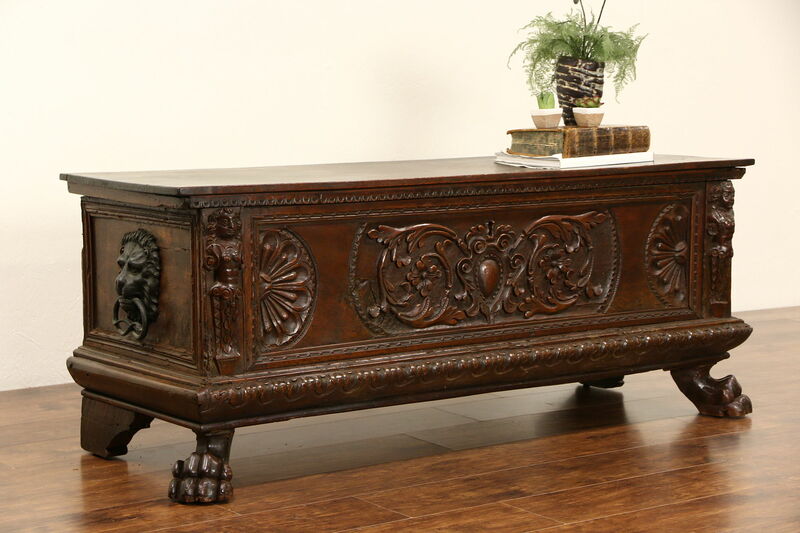 A traditional "Cassone" or dowry chest or trunk was hand carved of walnut in Italy during the early 1700's. Sculpted figures represent the bride and groom, lion paw feet are imposing. This historic chest would have been the prized possession of an aristocratic family. Filled with silver, pewter and linens, it was part of a daughter's dowry for her marriage. The old finish is in very fine condition, preserving lots of stains and mars for antique character. Waxed and buffed, all that is needed to maintain its warm patina is an occasional wipe with a soft dry cloth. The top includes a plank almost 19" wide. Every surface has marks from the carver's chisels and hand planes. Cast iron lion heads are handles. About 75 years ago, the interior was lined with natural cedar, for its resistance to insects. There are restorations to the feet over the centuries. Measurements are 61" long, 22" deep and 24" tall.